The simplest items of memorabilia can trigger a trip on a time machine. Take, for instance, the paper bag discovered in a drawer at his home by a colleague. It's record-sized from the days when seven-inch singles were popular and printed on the side it says "Pearson's Disc-a-Go-Go, Kirkgate, Bradford". The bag dates from the time, around 1968-69, when my colleague was a founder member of the Burnley R&B Appreciation Society. This short-lived organisation had just five members, one of whom must have travelled from Lancashire to Bradford and bought something from Pearson's record shop. Not long afterwards, with the Kirkgate premises scheduled for demolition, Pearson's moved to Rawson Place. But to begin, as they say, at the beginning. This family business first appeared on the Bradford scene in 1959 at a stall in John Street Market where music fans could buy the latest 78rpm records they'd heard on Radio Luxembourg as well as new-fangled 45s and EPs. The stall was a winner, so shortly afterwards Pearson's opened their first-ever shop in Manchester Road. Then, in 1967, came the Kirkgate venture. 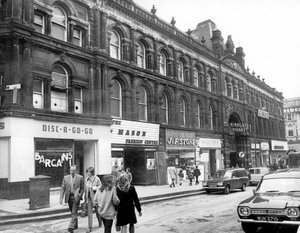 It, too, was a success, and was followed by openings in Brighouse and Leeds, but the prospect of demolition in 1972 prompted a move to smart premises at the top of Rawson Square, on the same side as the market. There the business occupied three storeys and had around 8,000 sq ft of display and storage space. The T&A reported on December 8, 1971, that budget albums were a speciality of the new shop, with LPs selling for less than 50p. The report added: "Side by side with records by popular singers and groups are thousands of records of instrumentalists, jazz, folk, Christmas carols, classical, and, of course, the latest singles and hit parade sounds. In addition a large basement floor is devoted to progressive music." In charge of this department was Dave Stansfield, who was also a member of local band Moonkyte and a promoter of major rock concerts in Bradford. His association with Pearson's began during the Kirkgate days. He recalls: "I started to work for Tom (Tommy) Pearson and his wife Ethel on a casual basis. I realised that the times really were a changin' for music in the 1960s and tried to persuade him to open up his upstairs on Kirkgate to broaden out music sales. Slowly we built up a whole floor of what was called progressive' music. I always hated that label but I wasn't going to argue. "Sales took off radically. I was able to employ Moonkyte colleague Dave Foster as my assistant. It was like Batman and Robin on Acid. We ordered whatever we wanted and eventually became so blas that if we didn't like the cover of an album we wouldn't order it. "Saturdays used to be like a Medina in Morocco. Always crammed with noise and buyers. We also became a kind of information centre for what was going on in music: new bands, local gigs etc. "Tommy Pearson was a one-off. I guess that Moonkyte was born in Kirkgate. Tommy used to lend us his van and even helped with the purchase of a PA. He also bankrolled the later concerts at St George's Hall that I put on. That's why we could get more than one big group on the bill. He never lost money - always made it. "Pearson's Kirkgate was such a success that he moved to Rawson Place. You could argue it was the first northern megastore occupying three floors. But it was never the same atmosphere. Kirkgate had the vibe. Rawson Place didn't. "I often think about Tommy with total affection. I know he died a few years ago. What made me very proud was that although Bradford was always the poor relative when compared to Leeds, that proved to be untrue as far as the record-buying public were concerned. They were packed with knowledge and were always open to suggestion. Pearson's, Kirkgate, was special and I hope they remember the shop like I do." 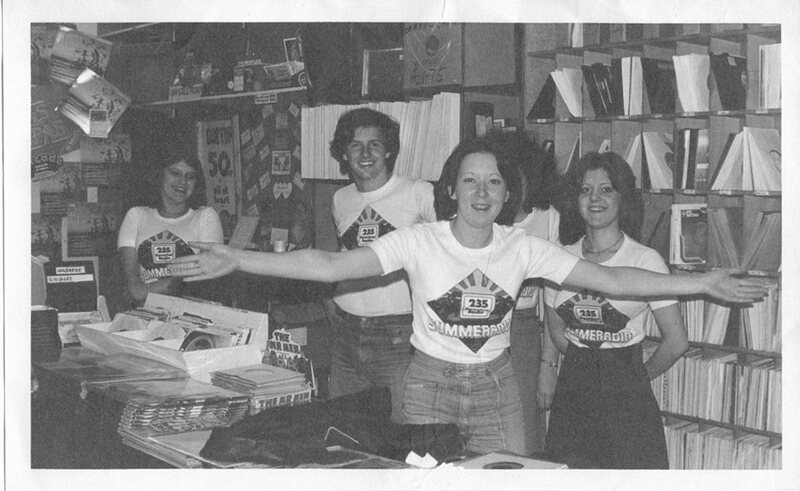 The T&A advertising feature which marked the opening of the Rawson Place premises reported: "Customers at the shop are many and varied and they include a number of disc jockeys. One section of the business's stock consists of a few hundred thousand deleted 45s, all unused, many of them valuable. With these the business intends to launch a record mail order service in the near future. Budget LPs could also be sold in this way." In the next couple of years the store branched out into sales of radio and hi-fi equipment as well as other electrical goods such as toasters, kettles and teamakers. It also dipped its toe into the waters of the fashion market. The advert from the T&A pictured here is undated but judging by the records listed on it was probably from the late 1972/early 1973 period. It shows that Pearson's had metamorphosed from a "Disc-a-Go-Go" sort of place to a "Hear and Wear" store with a "Fella's Department" in the basement selling Wrangler demins and shirts and Brutus and Ben Sherman shirts, and "Dollys" on the first floor where you could buy an all-wool coat for £2.99. A sad postscript to the Pearson story appears in a cutting from the T&A dated July 17, 1980. It reported that a winding-up order had been made on Pearson's Records in Bradford on June 30 and the first meeting of creditors had been called for July 22. Worked here 1976-79 loved everyday. Carol Butterfield.